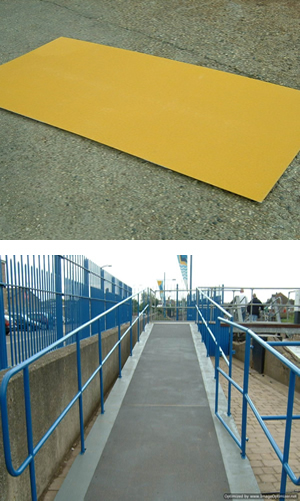 TreadSafe® GRP flat decking sheets are designed for internal and external applications on walkways, ramps, gangways and factory floors. They withstand movement of forklift trucks and other vehicles and can, therefore, be used in areas that are subject to heavy traffic. Manufactured from 4mm thick GRP, they are offered in standard sheet sizes of 2440 x 1200mm, 1200 x 1200mm, and 800 x 1200mm. Standard colour choices are black, blue and yellow. Any BS or RAL colour available subject to minimum order quantities.